Ever wonder if House Cleaners would be able to actually clean a house from top-to-bottom with Norwex? The answer is a resounding ‘Yes!’ Norwex is the BEST choice for House Cleaners. My fellow Canadian consultant Crystal Moore has spent time professionally cleaning houses. Her top choice was Norwex. What she discovered and loved the most was how much time she saved using Norwex! And of course, she was able to use green cleaners that actually worked. 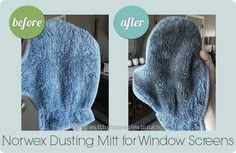 Whether you clean houses for a living, and are looking to add Norwex to your routine, or you’re wondering if you can clean your own house with just Norwex, Crystal has shared with me what she brings with her to do a top-to-bottom clean, so you can see for yourself that it can be done! Being so versatile, and so easy to use, these are the MUST have items for your cleaning bag. You can walk around the house with a damp Enviro Cloth, wiping down doorknobs, fingerprints on walls, stainless steel appliances, smudge marks on windows and mirrors, bathroom sinks and toilets with these. This cloth picks up grease, grime, germs and dirt with just water (it can remove up to 99% of bacteria from the surface)! Have a stash of different colors, that are used for different purposes (ie. blue is general purpose, pink is sinks and mirrors, green is toilets, etc). Use your Window cloth to polish appliances, windows, mirrors, glass surfaces and glossy furniture after cleaning them with the Enviro. This makes it easy to zip around and dust every surface. It uses static electricity to attract dust to it. On really dark furniture, get it slightly damp for an even more effective dust. Shake it outside like a polaroid picture every few rooms to get rid of the excess dust. This thing even gets the black dust from wood stoves! This is very effective for wiping down hardwood stairs too. Ever use one of those swifter-duster thingy’s? Those things are a waste of money people (sorry if you use them, ha!). You can get some with fragrance in them. Oh. man. Hello, asthma! These little guys are the secret to leaving things shiny! Kitchen and bathroom faucets, kitchen sinks, etc (as long as they’re not brushed nickel or brushed steel). Removes rust. Picks up sticky-stuck-on stuff from kitchen counters and floors. Hard water build up from drips that people have NEVER been able to get rid of. Gooey build-up around the edge of a sink. Just rub gently (unless it’s tile floor or grout), as it can scratch surfaces. And avoid using in plastic lined tubs, as it will scratch these for sure. This stuff is so effective in a shower, especially when paired with a Spirisponge on any collection of hard water, whether it’s on tile, tub, the faucet or the glass doors (*Rant: Crystal hates glass door showers and would have probably quit if it wasn’t for the Bathroom Cleaner, which actually helped her get anywhere with them!). Have a spray bottle of this, diluted with water, in your bag. To use, spray on the surface, leave for ten minutes, then wipe or rinse clean. You can squirt the Bathroom Cleaner, full strength, in the toilet bowl too (and you only need a little). This is a cleaner that is SAFE and gentle on your body, lungs and the water system! Take one and cut it into fourths, as it disintegrates as it’s used. This little hack will make it last longer. Keep this on hand for those stubborn wall marks. It’s great for so many random things too, that you’ll be missing it when you run out! Last, but not least, the mop. The beautiful, wonderful, versatile, adjustable, money-saving, life-made-easy, Norwex mop. Use the dry mop pad on hardwood floors to pick up dust and animal hair, as well as get under couches and beds. Use the rubber brush to wipe all the dust and dirt in the garbage can, then switch to the wet mop pad. Some houses are really soiled, so take the wet pad off after a few rooms, rub it under running water to clean it up a bit, give it a good squeeze, then tackle the next dirty room with it. Other houses may not have super soiled floors, but it begins to dry after a few rooms, so spray it with water to dampen it again. Switch to the Tile Mop pad on the tile floors for extra scrubbing power, as the wet pad doesn’t work so great on tile. What about if you clean more than one house in a day? Give all of your cloths and mop pads a good rub and rinse after your clean, before moving on to the next house. And have extra Enviro cloths too, that you save for the next house. 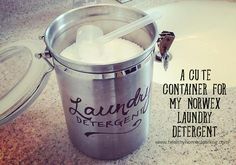 When you come home: Throw all of your cloths and mop pads in my washing machine, using hot water and the Norwex Ultra Power Plus laundry detergent. Then toss them in the dryer, plop them in your bags when they’re done, and you’re ready for tomorrow! Since house cleaners will use their Norwex products SO frequently, give them a deep clean once in a while for good maintenance. The orange and yellow plastic tubs in the bag are handy for holding wet or dirty Enviro cloths, damp sponges and gloves. Crystal says that Toms are her must-have indoor shoes for cleaning. They prevent dirt from sticking to your socks (at the really dirty houses), make cleaning more comfortable, and double as great dancing shoes! Sometimes, she’ll wear an apron with pockets to stash her Spirisponges and Window cloth, as she’s zipping around the house. She mainly wears the apron when she’s alone though, as it assists with dancing and singing loudly to the music she cranks at the empty houses. I tried the Blue Diamond tub and tile cleaner, It don’t work like they said it does. Also the oven and grill cleaner don’t work either. The towel I found the same in a dollar store! This is just another high price scam company!!!! Pat, I’m sorry to hear that you haven’t had good experience with the products! I truly use the products on a daily basis and have experienced such great results. I felt this way BEFORE I began to sell the product. In fact, I only started selling the product because it was so fantastic! While you can find Microfiber in the dollar store, it really isn’t the same. To be defined as microfiber, it only needs to be 1/6th of a human hair, while Norwex Microfiber is 1/200th. Also, Norwex microfiber has the added benefit of BacLock – the silver embedded in the cloth, which helps to clean the cloth itself within 24 hours, so it’s not harbouring bacteria. If you are unsatisfied with your Norwex products, I would encourage you to reach out to the consultant you purchased it from (was it from this site? Deja would be more than happy to talk with you!) to discuss it further to see what can be done to help! Thanks for this! I always love reading great tips for using Norwex. Just hired a cleaning lady and was trying to figure out how to request that she use my norwex products…thanks so much for this post! any other tips for cleaners would be fabulous!!!!! What all is in this professional cleaning kit that she takes with her? Hey Sara, thanks for your question. If you read through the post, you’ll see that it highlights everything in the bag! if you have any connecting websites i would appreciate any help I live in Allentown, PA area.